We're delighted to announce the release of SnapCall 4.4. This release is the culmination of our efforts to create a fun and engaging social experience for active sports fans. We all make calls during games, but SnapCall is a first: we record your responses to interactive predictions and rank you against friends and the entire viewing audience. 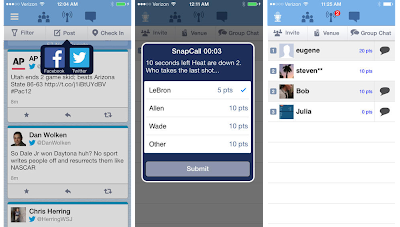 SnapCall 4.4 fully integrates Facebook and Twitter making it easier to connect with friends while competing in real-time. We've also added Venue Play where bar patrons can interact and compete - even if they're not friends in SnapCall i.e. flirt while competing. 4.4 is fully optimized for iPhone, iPad, and Android devices of all sizes. So with March Mania upon us, jump in the games and see how you stack up against the nation!